A public bike share system is expected to be up and running in Belfast by next Spring, Belfast City Council said today as it appointed a company to run the scheme. The contract between NSL and the council is for six years with an option to renew for a further 3 years to operate and maintain the scheme. The scheme in Belfast will be Northern Ireland’s first. The city council said that services company NSL is set to deliver and maintain the scheme with Nextbike providing the bicycle infrastructure and management system. If all goes well with plans on both sides of the border, it will bring the number cities on the island with public bike share systems to five. DublinBikes in the Republic’s capital is undergoing an expansion, and a now delayed Coke Zero sponsored system is to be in place in Cork, Limerick and Galway by the end of August. The council said “up to” 30 docking stations will be provided as part of the first phase of the scheme. Detail design will be worked on over the next three months and construction is due to take place from November 2014 to February 2015. The cost to users has not been finalised, but free use for the first 30 minutes of journeys is promised. 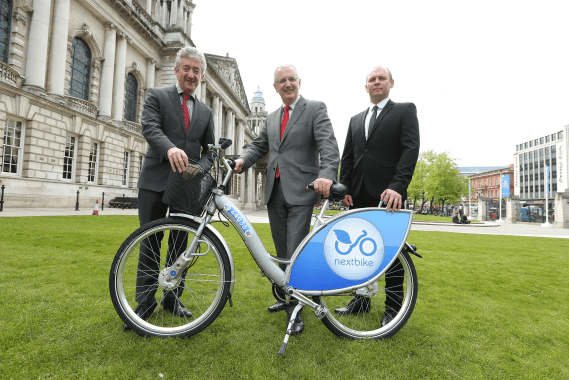 The city council will hold a preview of the bikes and docking stations on the grounds of Belfast City Hall from May 8 to 10 between 10am to 5pm. The city says that it is currently looking for potential sponsors for the scheme — a successful sponsor would get naming rights.